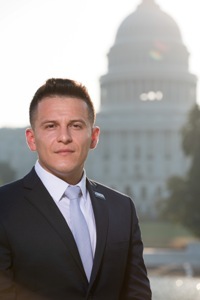 Alexis Sandoval-Uribe was born and raised in Stockton, California and is the son of two Hispanic immigrants who migrated to the United States from Mexico in search of the American Dream. Alexis’ parents, Martin and Miroslava, left the small towns of El Tejero and Maravatío in the state of Michoacán to become agricultural farm workers in the San Joaquin Central Valley. As a first-generation college student and active leader in his community, Alexis has been the proud beneficiary of numerous scholarships, internships, and global research opportunities. In 2016, he earned his Bachelor and Master of Science degrees from the University of Southern California. During his tenure at USC, Alexis served as an exemplary Research Associate at the USC Norris Comprehensive Cancer Center where he helped pioneer the first-ever genome wide association study of colorectal cancer in Hispanics. As a USC Global Fellow and McNair Scholar, he also held medical and health policy internships in Taiwan and Brazil. Alexis is an aspiring physician and visionary who hopes to pursue a career in family and emergency medicine while using his global health experience to positively impact local communities. After completing medical school and residency training he looks forward to serving his community in Stockton. As a CHCI Health Graduate Fellow, Alexis will research strategic and targeted policy development to improve federal support for graduate medical education and mental health support among underrepresented communities.